"Roll Your Wrist at Contact"
Rolling the wrists before or near contact is a serious mechanical flaw that results in loss of power and consistency. During my research, which related to how energy is transferred in the swing, I concluded that premature rolling of the wrists is a killer flaw. In the study, I identified 26 major league baseball players players whose wrists consistently started to roll prior to contact. The batting average for this group was .224 and their average homerun production was 2.1 per year. Three year later, only 4 of those players were still in the major leagues. The early rolling of the wrist causes the lead elbow to start breaking down-and-in too soon. This alters the natural trajectory or plane of the swing. Most players who finish their swing low will also have a problem with the wrist roll. Limited shoulder rotation and having the body too vertical or tilted toward the pitcher at contact are also characteristics of the wrist roll. The rolling over of the wrist is a natural part of the baseball swing when it occurs at the proper time. It will naturally take place when both arms come almost to full extension and they form the "V" position. Good hitters will have rotated their hips and shoulders about 90 degrees at contact, and now the "V" position and the rolling of the wrist occurs when the bat is close to pointing at the pitcher. Even on outside pitches where rotation is much less, the bat should have rotated 15 or 20 degrees past the contact point before the back arm nears full extension and the arms and the wrist start to roll. 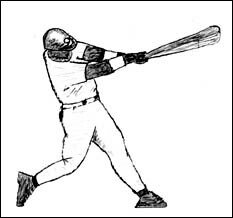 Hitters who have little shoulder rotation and mainly use the arms to accelerate the bat can reach full extensions while the bat head is farther back in the swing, which allows the wrists to roll at or before contact.